The budget for rural road and bridge construction approved for this 2017-18 fiscal year was barely 10 percent of last year’s, said Union Minister for Agriculture, Livestock and Irrigation, Dr Aung Thu. Between late April and the third week of May, the country exported more than 360,000 tonnes of rice, up 260,000 tonnes from the same period last year, according to the Ministry of Commerce. Lawmakers in Yangon’s regional parliament are demanding a wide-ranging review of rental contracts that they suspect were awarded at knockdown prices under the previous military-backed administration of President Thein Sein. Frontier digs deeper into the K7.5 billion oil tax scandal in Magway Region involving the former chief minister and finds murky business links, conflicted lawmakers and a government putting political expediency above the rule of law. 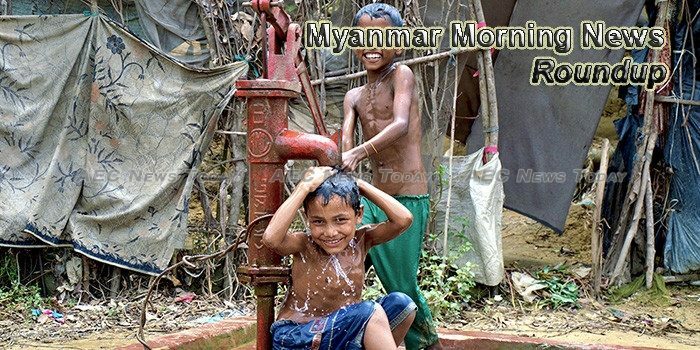 Today the Norwegian Refugee Council (NRC) released a list of ‘The world’s most neglected displacement crises’ for 2016, and Myanmar was ranked No. 9, between Ukraine and Somalia. The Lower House approved a proposal to urge the government to systematically implement green land projects in Nay Pyi Taw, Yangon, Mandalay and Pyin Oo Lwin as soon as possible. Puma Energy has become the first foreign investor to be granted permission to import, distribute and sell fuel, in a move that could herald a shakeup of the retail market. Shares of Avacta Group PLC (AVCT.L) are moving on volatility today -1.55% or $-1.50 from the open. The LSE listed company saw a recent bid of $95.00 and 1000 shares have traded hands in the session. Dentons has launched an office in Myanmar through the acquisition of a seven-strong local team led by partner Mark Livingston. Myanmar announced plans yesterday to strengthen its disaster response systems in the wake of Cyclone Mora, which killed scores of people in neighbouring Bangladesh and left thousands homeless in both nations, state media reported on 2 June. Mining companies in the Hpakant and Lone Khin jade mining areas have been operating in each other’s existing licensed plots after the expiration of their licenses, resource watchdog and advocacy group Global Witness and Kachin Development Networking Group (KDNG) said. To pave the way for making this a reality, a high level business delegation led by the American Chamber of Commerce in Myanmar (AMCHAM Myanmar), visited Mandalay and met with government officials. The Mandalay Jetty will be upgraded at a cost of US$38 million in an effort to promote riverine trade in the region, according to the Regional Minister for Electricity, Industry and Construction U Zarni Aung.